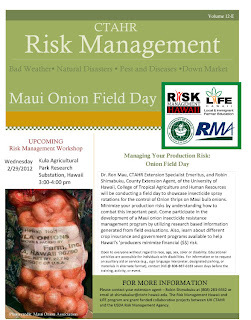 Dr. Ron Mau, CTAHR Extension Specialist Emeritus, and Robin Shimabuku, County Extension Agent, of the University of Hawaii, College of Tropical Agriculture and Human Resources will be conducting a field day to showcase insecticide spray rotations for the control of Onion thrips on Maui bulb onions. Minimize your production risks by understanding how to combat this important pest. Come participate in the development of a Maui onion insecticide resistance management program by utilizing research based information generated from field evaluations. 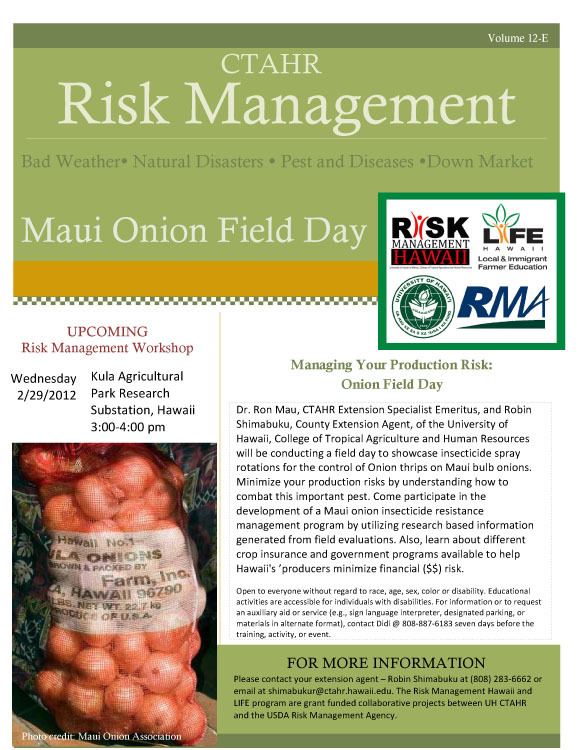 Also, learn about different crop insurance and government programs available to help Hawaii's ’producers minimize financial ($$) risk.